We already know that Game Of Thrones is coming back for its final few episodes on April 14 and that the confusing new season of Big Little Lies will premiere in June, but those aren’t the only shows on HBO—even if they are a couple of the most important shows on HBO. Now, thanks to Variety, we also know when Veep is going to drop its own final season, with Julia Louis-Dreyfus and Tony Hale finally going to war against the Night King and his White Walkers (not to mention the inevitable drama when Matt Walsh finally returns to Winterfell with Daenerys). 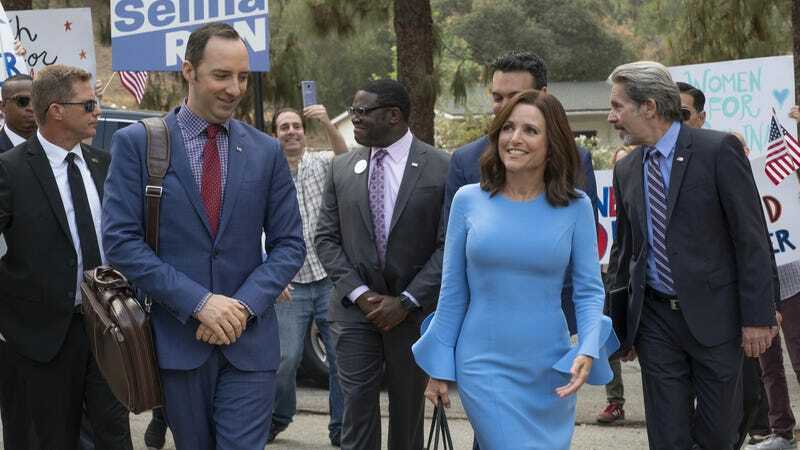 We may be getting Veep confused with something else, but either way, its seventh and final season will premiere on HBO on March 31. Speaking of HBO premieres happening in March, HBO has also announced that the controversial Michael Jackson documentary Leaving Neverland will premiere in two parts on March 3 and March 4. This is the film that slammed at Sundance but Jackson’s family, with them referring to it as a “public lynching” that didn’t have “a shred of proof or single piece of physical evidence.” It’s based around testimony from a pair of men who claim that Jackson molested them as children, and the two-night rollout over a Sunday and a Monday seems perfectly designed to generate some hot word-of-mouth buzz from one day to the next. Michael Jackson&apos;s family decries Leaving Neverland documentary, calling it a "public lynching"